Malala Yousafzai (Mallah Ysafzay: Urdu : ; Pashto: ; born 12 July 1997) is a Pakistani activist for female education and the youngest Nobel Prize laureate. She is known for human rights advocacy, especially education of women in her native Swat Valley in Khyber Pakhtunkhwa, northwest Pakistan, where the local Taliban had at times banned girls from attending school. Her advocacy has grown into an international movement. Yousafzai was born in Mingora, Khyber Pakhtunkhwa, Pakistan. Her family came to run a chain of schools in the region. Considering Jinnah and Benazir Bhutto as her role models, she was particularly inspired by her father‘s thoughts and humanitarian work. In early 2009, when she was 11-12, she wrote a blog under a pseudonym for the BBC Urdu detailing her life during the Taliban occupation of Swat. The following summer, journalist Adam B. Ellick made a New York Times documentary about her life as the Pakistani military intervened in the region. She rose in prominence, giving interviews in print and on television, and she was nominated for the International Children’s Peace Prize by activist Desmond Tutu. Yousafzai was injured on 9 October 2012 by a Taliban gunman when he attempted to murder her. She remained unconscious and in critical condition at the Rawalpindi Institute of Cardiology, but later her condition improved enough for her to be sent to the Queen Elizabeth Hospital in Birmingham, UK. The murder attempt sparked a national and international outpouring of support for Yousafzai. Deutsche Welle wrote in January 2013 that she may have become “the most famous teenager in the world.” Weeks after her murder attempt, a group of fifty leading Muslim clerics in Pakistan issued a fatw against those who tried to kill her. Since recovering, Yousafzai became a prominent education activist. Based out of Birmingham, she founded the Malala Fund, a non-profit, and in 2013 co-authored I am Malala, an international bestseller. In 2015, Yousafzai was a subject of the Oscar-shortlisted documentary He Named Me Malala. The 2013, 2014 and 2015 issues of Time magazine featured her as one of the most Influential people globally. In 2012, she was the recipient of Pakistan’s first National Youth Peace Prize and the 2013 Sakharov Prize. In 2014, she was announced as the co-recipient of the 2014 Nobel Peace Prize, along with Kailash Satyarthi, for her struggle against the suppression of children and young people and for the right of all children to education. Aged 17 at the time, she became the youngest-ever Nobel Prize laureate. From 2013 to 2017, she was a pupil at the all-girls’ Edgbaston High School in Birmingham. In 2017, she was awarded honorary Canadian citizenship and became the youngest person to address the House of Commons of Canada. In August 2017, she gained admission to Lady Margaret Hall, Oxford to study for a bachelor’s degree in Philosophy, Politics and Economics (PPE). Yousafzai was born on 12 July 1997 in the Swat District of Pakistan’s northwestern Khyber Pakhtunkhwa province into a lower-middle-class family to Ziauddin Yousafzai and Tor Pekai Yousafzai. Her family is a Sunni Muslim family of Pashtun ethnicity. The family did not have enough money for a hospital birth; Yousafzai was born at home with the help of neighbours. She was given her first name Malala (meaning “grief-stricken”) after Malalai of Maiwand, a famous Pashtun poet and warrior woman from southern Afghanistan. Her last name, Yousafzai, is that of a large Pashtun tribal confederation that is predominant in Pakistan’s Swat Valley, where she grew up. At her house in Mingora, she lived with her two younger brothers, Khushal and Atal, her parents, Ziauddin and Tor Pekai, and two pet chickens. Fluent in Pashto, English, and Urdu, Yousafzai was educated mostly by her father, Ziauddin Yousafzai, who is a poet, school owner, and an educational activist himself, running a chain of private schools known as the Khushal Public School. She once stated to an interviewer that she would like to become a doctor, though later her father encouraged her to become a politician instead. Ziauddin referred to his daughter as something entirely special, allowing her to stay up at night and talk about politics after her two brothers had been sent to bed. Inspired by Muhammad Ali Jinnah and Prime Minister Benazir Bhutto, Yousafzai started speaking about education rights as early as September 2008, when her father took her to Peshawar to speak at the local press club. “How dare the Taliban take away my basic right to education?” Yousafzai asked her audience in a speech covered by newspapers and television channels throughout the region. In 2009, Yousafzai began as a trainee and then a peer educator in the Institute for War and Peace Reporting‘s Open Minds Pakistan youth programme, which worked in schools in the region to help young people engage in constructive discussion on social issues through the tools of journalism, public debate and dialogue. In late 2008, Aamer Ahmed Khan of the BBC Urdu website and his colleagues came up with a novel way of covering the Taliban‘s growing influence in Swat. They decided to ask a schoolgirl to blog anonymously about her life there. Their correspondent in Peshawar, Abdul Hai Kakar, had been in touch with a local school teacher, Ziauddin Yousafzai, but could not find any students willing to do so, as it was considered too dangerous by their families. Finally, Yousafzai suggested his own daughter, 11-year-old Malala. At the time, Taliban militants led by Maulana Fazlullah were taking over the Swat Valley, banning television, music, girls’ education, and women from going shopping. Bodies of beheaded policemen were being displayed in town squares. At first, a girl named Aisha from her father’s school agreed to write a diary, but then the girl’s parents stopped her from doing it because they feared Taliban reprisals. The only alternative was Yousafzai, four years younger than the original volunteer, and in seventh grade at the time. Editors at the BBC unanimously agreed. I had a terrible dream yesterday with military helicopters and the Taliban. I have had such dreams since the launch of the military operation in Swat. My mother made me breakfast and I went off to school. I was afraid going to school because the Taliban had issued an edict banning all girls from attending schools. Only 11 out of 27 pupils attended the class because the number decreased because of the Taliban’s edict. My three friends have shifted to Peshawar, Lahore and Rawalpindi with their families after this edict. “We had been covering the violence and politics in Swat in detail but we didn’t know much about how ordinary people lived under the Taliban,” Mirza Waheed, the former editor of BBC Urdu, said. Because they were concerned about Yousafzai’s safety, BBC editors insisted that she use a pseudonym. Her blog was published under the byline “Gul Makai” (“cornflower” in Urdu), a name taken from a character in a Pashtun folktale. On 3 January 2009, Yousafzai’s first entry was posted to the BBC Urdu blog. She would hand-write notes and then pass them on to a reporter who would scan and e-mail them. The blog records Yousafzai’s thoughts during the First Battle of Swat, as military operations take place, fewer girls show up to school, and finally, her school shuts down. In Mingora, the Taliban had set an edict that no girls could attend school after 15 January 2009. The group had already blown up more than a hundred girls’ schools. The night before the ban took effect was filled with the noise of artillery fire, waking Yousafzai several times. The following day, Yousafzai also read for the first time excerpts from her blog that had been published in a local newspaper. In February 2009, girls’ schools were still closed. In solidarity, private schools for boys had decided not to open until 9 February, and notices appeared saying so. On 7 February, Yousafzai and her brother returned to their hometown of Mingora, where the streets were deserted, and there was an “eerie silence”. “We went to the supermarket to buy a gift for our mother but it was closed, whereas earlier it used to remain open till late. Many other shops were also closed”, she wrote in her blog. Their home had been robbed and their television was stolen. After boys’ schools reopened, the Taliban lifted restrictions on girls’ primary education, where there was co-education. Girls-only schools were still closed. Yousafzai wrote that only 70 pupils attended, out of 700 pupils who were enrolled. On 15 February, gunshots could be heard in the streets of Mingora, but Yousafzai’s father reassured her, saying “don’t be scared – this is firing for peace”. Her father had read in the newspaper that the government and the militants were going to sign a peace deal the next day. Later that night, when the Taliban announced the peace deal on their FM Radio studio, another round of stronger firing started outside. Yousafzai spoke out against the Taliban on the national current affairs show Capital Talk on 18 February. Three days later, local Taliban leader Maulana Fazlulla announced on his FM radio station that he was lifting the ban on women’s education, and girls would be allowed to attend school until exams were held on 17 March, but they had to wear burqas. On 25 February, Yousafzai wrote on her blog that she and her classmates “played a lot in class and enjoyed ourselves like we used to before”. Attendance at Yousafzai’s class was up to 19 of 27 pupils by 1 March, but the Taliban were still active in the area. Shelling continued, and relief goods meant for displaced people were looted. Only two days later, Yousafzai wrote that there was a skirmish between the military and Taliban, and the sounds of mortar shells could be heard: “People are again scared that the peace may not last for long. Some people are saying that the peace agreement is not permanent, it is just a break in fighting”. After the BBC diary ended, Yousafzai and her father were approached by New York Times reporter Adam B. Ellick about filming a documentary. In May, the Pakistani Army moved into the region to regain control during the Second Battle of Swat. Mingora was evacuated and Yousafzai’s family was displaced and separated. Her father went to Peshawar to protest and lobby for support, while she was sent into the countryside to live with relatives. “I’m really bored because I have no books to read,” Yousafzai is filmed saying in the documentary. That month, after criticising militants at a press conference, Yousafzai’s father received a death threat over the radio by a Taliban commander. Yousafzai was deeply inspired in her activism by her father. That summer, for the first time, she committed to becoming a politician and not a doctor, as she had once aspired to be. I have a new dream … I must be a politician to save this country. There are so many crises in our country. I want to remove these crises. By early July, refugee camps were filled to capacity. The prime minister made a long-awaited announcement saying that it was safe to return to the Swat Valley. The Pakistani military had pushed the Taliban out of the cities and into the countryside. Yousafzai’s family reunited, and on 24 July 2009 they headed home. They made one stop first – to meet with a group of other grassroots activists that had been invited to see United States President Barack Obama‘s special representative to Afghanistan and Pakistan, Richard Holbrooke. Yousafzai pleaded with Holbrooke to intervene in the situation, saying, “Respected ambassador, if you can help us in our education, so please help us.” When her family finally did return home, they found it had not been damaged, and her school had sustained only light damage. Following the documentary, Yousafzai was interviewed on the national Pashto-language station AVT Khyber, the Urdu-language Daily Aaj, and Canada’s Toronto Star. She made a second appearance on Capital Talk on 19 August 2009. Her BBC blogging identity was being revealed in articles by December 2009. She also began appearing on television to publicly advocate for female education. In October 2011, Archbishop Desmond Tutu, a South African activist, nominated Yousafzai for the International Children’s Peace Prize of the Dutch international children’s advocacy group KidsRights Foundation. She was the first Pakistani girl to be nominated for the award. The announcement said, “Malala dared to stand up for herself and other girls and used national and international media to let the world know girls should also have the right to go to school”. The award was won by Michaela Mycroft of South Africa. Her public profile rose even further when she was awarded Pakistan’s first National Youth Peace Prize two months later in December. On 19 December 2011, Prime Minister Yousaf Raza Gillani awarded her the National Peace Award for Youth. At the proceedings in her honour, Yousafzai stated that she was not a member of any political party, but hoped to found a national party of her own to promote education. The prime minister directed the authorities to set up an IT campus in the Swat Degree College for Women at Yousafzai’s request, and a secondary school was renamed in her honour. By 2012, Yousafzai was planning to organise the Malala Education Foundation, which would help poor girls go to school. As Yousafzai became more recognised, the dangers facing her increased. Death threats against her were published in newspapers and slipped under her door. On Facebook, where she was an active user, she began to receive threats and fake profiles were created under her name. When none of this worked, a Taliban spokesman says they were “forced” to act. In a meeting held in the summer of 2012, Taliban leaders unanimously agreed to kill her. On 9 October 2012, a Taliban gunman shot Yousafzai as she rode home on a bus after taking an exam in Pakistan’s Swat Valley. The masked gunman shouted “Which one of you is Malala? Speak up, otherwise I will shoot you all”, and, on her being identified, shot at her. She was hit with one bullet, which went through her head, neck, and ended in her shoulder. Two other girls were also wounded in the shooting: Kainat Riaz and Shazia Ramzan, both of whom were stable enough to speak to reporters and provide details of the attack. After the shooting, Yousafzai was airlifted to a military hospital in Peshawar, where doctors were forced to begin operating after swelling developed in the left portion of her brain, which had been damaged by the bullet when it passed through her head. After a five-hour operation, doctors successfully removed the bullet, which had lodged in her shoulder near her spinal cord. The day following the attack, doctors performed a decompressive craniectomy, in which part of the skull is removed to allow room for the brain to swell. On 11 October 2012, a panel of Pakistani and British doctors decided to move Yousafzai to the Armed Forces Institute of Cardiology in Rawalpindi. Mumtaz Khan, a doctor, said that she had a 70% chance of survival. Interior Minister Rehman Malik said that Yousafzai would be moved to Germany, where she could receive the best medical treatment, as soon as she was stable enough to travel. A team of doctors would travel with her, and the government would bear the expenditures of her treatment. Doctors reduced Yousafzai’s sedation on 13 October, and she moved all four limbs. Offers to treat Yousafzai came from around the world. On 15 October, Yousafzai travelled to the United Kingdom for further treatment, approved by both her doctors and family. Her plane landed in Birmingham, England where she was treated at the Queen Elizabeth Hospital, one of the specialties of this hospital being the treatment of military personnel injured in conflict. According to the UK Government “The Pakistani government is paying all transport, migration, medical, accommodation and subsistence costs for Malala and her party”. Yousafzai had come out of her coma by 17 October 2012, was responding well to treatment, and was said to have a good chance of fully recovering without any brain damage. Later updates on 20 and 21 October stated that she was stable, but was still battling an infection. By 8 November, she was photographed sitting up in bed. On 3 January 2013, Yousafzai was discharged from the hospital to continue her rehabilitation at her family’s temporary home in the West Midlands. She underwent a five-hour long operation on 2 February to reconstruct her skull and restore her hearing with a cochlear implant, after which she was reported to be in stable condition. Pakistan’s president Asif Ali Zardari described the shooting as an attack on “civilized people”. UN Secretary-General Ban Ki-moon called it a “heinous and cowardly act”. United States President Barack Obama found the attack “reprehensible, disgusting and tragic”, while Secretary of State Hillary Clinton said Yousafzai had been “very brave in standing up for the rights of girls” and that the attackers had been “threatened by that kind of empowerment”. British Foreign Secretary William Hague called the shooting “barbaric” and that it had “shocked Pakistan and the world”. American singer Madonna dedicated her song “Human Nature” to Yousafzai at a concert in Los Angeles the day of the attack, as well had a temporary Malala tattoo on her back. American actress Angelina Jolie wrote an article about explaining the event to her children and answering questions like “Why did those men think they needed to kill Malala?” Jolie later donated $200,000 to The Malala Fund for girls education. Former First Lady of the United States Laura Bush wrote an op-ed piece in The Washington Post in which she compared Yousafzai to Holocaust diarist Anne Frank. Indian director Amjad Khan announced that he would be making a biographical film based on Yousafzai. Ehsanullah Ehsan, chief spokesman for the Pakistani Taliban, claimed responsibility for the attack, saying that Yousafzai “is the symbol of the infidels and obscenity,” adding that if she survived, the group would target her again. In the days following the attack, the Taliban reiterated its justification, saying Yousafzai had been brainwashed by her father: “We warned him several times to stop his daughter from using dirty language against us, but he didn’t listen and forced us to take this extreme step”. The Taliban also justified its attack as part of religious scripture, stating that the Quran says that “people propagating against Islam and Islamic forces would be killed”, going on to say that “Sharia says that even a child can be killed if he is propagating against Islam”. On 12 October 2012, a group of 50 Islamic clerics in Pakistan issued a fatw – a ruling of Islamic law – against the Taliban gunmen who tried to kill Yousafzai. Islamic scholars from the Sunni Ittehad Council publicly denounced attempts by the Pakistani Taliban to mount religious justifications for the shooting of Yousafzai and two of her classmates. Although the attack was roundly condemned in Pakistan, “some fringe Pakistani political parties and extremist outfits” have aired conspiracy theories, such as the shooting being staged by the American Central Intelligence Agency to provide an excuse for continuing drone attacks. The Pakistani Taliban and some other pro-Taliban elements branded Yousafzai an “American spy”. On 15 October 2012, UN Special Envoy for Global Education Gordon Brown, the former British Prime Minister, visited Yousafzai while she was in the hospital, and launched a petition in her name and “in support of what Malala fought for”. Using the slogan “I am Malala”, the petition’s main demand was that there be no child left out of school by 2015, with the hope that “girls like Malala everywhere will soon be going to school”. Brown said he would hand the petition to President Zardari in Islamabad in November. The day after the shooting, Pakistan’s Interior Minister Rehman Malik stated that the Taliban gunman who shot Yousafzai had been identified. Police named 23-year-old Atta Ullah Khan, a graduate student in chemistry, as the gunman in the attack. As of 2015 he remained at large, possibly in Afghanistan. The police also arrested six men for involvement in the attack, but they were later released for lack of evidence. As of 7 November 2012, Mullah Fazlullah, the cleric who ordered the attack on Yousafzai, was confirmed to be hiding in Eastern Afghanistan by US sources there. On 12 September 2014, ISPR Director, Major General Asim Bajwa, told a media briefing in Islamabad that the 10 attackers belong to a militant group called “Shura”. General Bajwa said that Israrur Rehman was the first militant group member who was identified and apprehended by the troops. Acting upon the information received during his interrogation, all other members of the militant group were arrested. It was an intelligence-based joint operation conducted by ISI, police, and military. In April 2015, the ten who were arrested were sentenced to life in prison by Judge Mohammad Amin Kundi, a counterterrorism judge, with the chance of eligibility for parole, and possible release, after 25 years. It is not known if the actual would-be murderers were among the ten sentenced. In June 2015, it was revealed that eight of the ten men tried in-camera for the attack had in fact been secretly acquitted, insiders revealed one of the men acquitted and freed was the murder bid’s mastermind. It is believed that all other men who shot Yousafzai fled to Afghanistan afterwards and were never even captured. The information about the release of suspects came to light after the London Daily Mirror attempted to locate the men in prison. Senior police official Salim Khan stated that the eight men were released because there was not enough evidence to connect them to the attack. Yousafzai spoke before the United Nations in July 2013, and had an audience with Queen Elizabeth II in Buckingham Palace. In September, she spoke at Harvard University, and in October, she met with US President Barack Obama and his family; during that meeting, she confronted him on his use of drone strikes in Pakistan. In December, she addressed the Oxford Union. In July 2014, Yousafzai spoke at the Girl Summit in London, advocating for rights for girls. In October 2014, after receiving the World Children’s Prize for the rights of the child in Mariefred, Sweden, she announced donating $50,000 through the UNRWA, to help rebuild 65 schools in Gaza. Former British Prime Minister Gordon Brown arranged for Yousafzai’s appearance before the United Nations in July 2013. Brown also requested that McKinsey consultant Shiza Shahid, a friend of the Yousafzai family, chair Yousafzai’s charity fund, which had gained the support of Angelina Jolie. Google’s vice-president Megan Smith also sits on the fund’s board. In November 2012, the consulting firm Edelman began work for Yousafzai on a pro bono basis, which according to the firm “involves providing a press office function for Malala.” The office employs five people, and is headed by speechwriter Jamie Lundie. McKinsey also continues to provide assistance to Yousafzai. On 12 July 2013, Yousafzai’s 16th birthday, she spoke at the UN to call for worldwide access to education. The UN dubbed the event “Malala Day”. Yousafzai wore one of Benazir Bhutto‘s shawls to the UN. It was her first public speech since the attack, leading the first ever Youth Takeover of the UN, with an audience of over 500 young education advocates from around the world. The terrorists thought they would change my aims and stop my ambitions, but nothing changed in my life except this: weakness, fear and hopelessness died. Strength, power and courage was born … I am not against anyone, neither am I here to speak in terms of personal revenge against the Taliban or any other terrorist group. I’m here to speak up for the right of education for every child. I want education for the sons and daughters of the Taliban and all terrorists and extremists. The Pakistani government did not comment on Yousafzai’s UN appearance, amid a backlash against her in Pakistan’s press and social media. 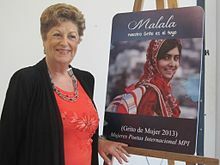 On 10 October 2014, Yousafzai was announced as the co-recipient of the 2014 Nobel Peace Prize for her struggle against the suppression of children and young people and for the right of all children to education. Having received the prize at the age of 17, Yousafzai is the youngest Nobel laureate. Yousafzai shared the prize with Kailash Satyarthi, a children’s rights activist from India. She is the second Pakistani to receive a Nobel Prize after 1979 Physics laureate Abdus Salam. A young Mexican man interrupted Yousafzai’s Nobel Peace Prize award ceremony in protest for the 2014 Iguala mass kidnapping in Mexico, but was quickly taken away by security personnel. Yousafzai later sympathised, and acknowledged that problems are faced by young people all over the world, saying “there are problems in Mexico, there are problems even in America, even here in Norway, and it is really important that children raise their voices”. On 12 July 2015, her 18th birthday, Yousafzai opened a school in the Bekaa Valley, Lebanon, near the Syrian border, for Syrian refugees. The school, funded by the not-for-profit Malala Fund, offers education and training to girls aged 14 to 18 years. Yousafzai called on world leaders to invest in “books, not bullets”. The All Pakistan Private School’s Federation announced that the book would be banned in its 152,000 member institutions, stating that it disrespected Islam and could have a “negative” influence. Pakistani investigative editor Ansar Abbasi described her work as “providing her critics something ‘concrete’ to prove her as an ‘agent’ of the West against Islam and Pakistan”. A children’s edition of the memoir was published in 2014 under the title I Am Malala: How One Girl Stood Up for Education and Changed the World. The audio book edition, narrated by Neela Vaswani, won the 2015 Grammy Award for Best Children’s Album. In February 2014, she was nominated for the World Children’s Prize in Sweden. Even though she was fighting for women’s rights as well as children’s rights, she did not describe herself as feminist when asked on Forbes Under 30 Summit in 2014. In 2015, however, Yousafzai told Emma Watson she decided to call herself a feminist after hearing Watson’s speech at the UN launching the HeForShe campaign. In May 2014, Yousafzai was granted an honorary doctorate by the University of King’s College in Halifax, Nova Scotia. Later in 2014, she was announced as the co-recipient of the 2014 Nobel Peace Prize, along with Kailash Satyarthi, for her struggle against the suppression of children and young people and for the right of all children to education. Aged 17 at the time, she became the youngest-ever Nobel Prize laureate. She was the subject of Oscar-shortlisted 2015 documentary He Named Me Malala. From March 2013 to July 2017, Yousafzai was a pupil at the all-girls’ Edgbaston High School in Birmingham. In August 2017, she was accepted at Lady Margaret Hall, University of Oxford. Reception of Yousafzai in Pakistan is mixed. Dawn columnist Huma Yusuf summarized three main complaints of Yousafzai’s critics: “Her fame highlights Pakistan’s most negative aspect (rampant militancy); her education campaign echoes Western agendas; and the West’s admiration of her is hypocritical because it overlooks the plight of other innocent victims, like the casualties of U.S. drone strikes.” Another Dawn journalist, Cyril Almeida, addressed the public’s lack of rage against the Tehrik-i-Taliban Pakistan (TTP), blaming the failing state government. Journalist Assed Baig described her as being used to justify Western imperialism as “the perfect candidate for the white man to relieve his burden and save the native”. Yousafzai was also accused on social media of being a CIA spy. However, Yousafzai does have some support in Pakistani media; Farman Nawaz argues that Yousafzai would have gained more fame in Pakistan if she belonged to the province of Punjab. His opinion was not given importance by the mainstream media of Pakistan but his views in this regard were published by Daily Outlook Afghanistan. 2015: Asteroid 316201 Malala named in her honour. A documentary titled He Named Me Malala by American filmmaker Davis Guggenheim was released on 2 October 2015. National Geographic broadcast the film on 29 February 2016. The upcoming Hindi film Gul Makai is a biopic of Malala in which Reem Sameer Shaikh will be portraying her.